Superstorm Sandy has sparked new energy to deal with climate change—but how? Have prevailing press accounts and institute reports captured the full range of New Yorkers’ response to the storm? 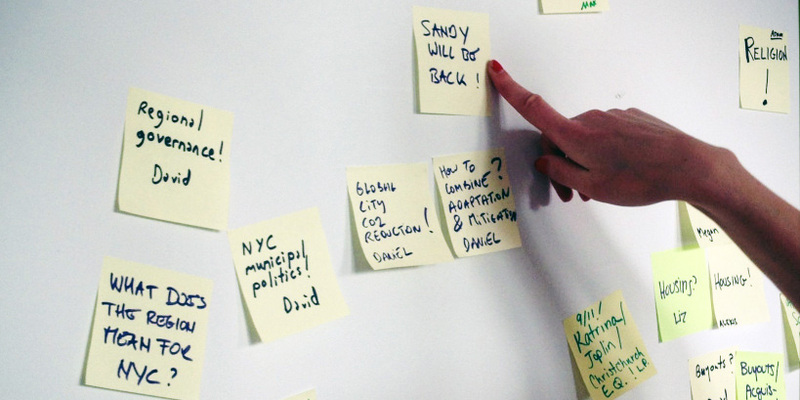 This research project looks at two sets of questions: 1) How do different individuals and groups in New York expect Sandy to change (or how are they hoping to influence) the place of climate change in the city’s broader political landscape? How should New York think the city should balance the need to continue mitigating carbon emissions while adapting to warming’s effects? 2) How did Hurricane Sandy’s impact and after-effects intersect with already enduring social inequalities? And how are rebuilding efforts addressing—or exacerbating—these inequalities, especially with respect to climate vulnerability? Scholars have observed that disasters can bring both environmental issues and religion to the fore, but few have looked at how these intersect in a disaster aftermath situation. This project looks at how over 100 Christian leaders from diverse traditions in New York City talked to their congregations about the environment, theology, and politics in a moment of heightened environmental and political awareness, the near-simultaneous experience of Superstorm Sandy and the 2012 presidential election. In particular, I examine how experience with the storm and tradition (including theology and practice) shape how leaders understand and communicate about this moment, with an eye towards identifying potential opportunities and challenges for dialogue between climate activists and religious communities. How do disaster relief workers understand their work and their relation to to affected residents? How does gender affect these understandings? This project looks at gender as both an attribute of individual women and men and more subtly, as a set of meanings and valuations attached to certain behaviors and practices. The project compares three different groups of people involved in disaster response: religious leaders, volunteer responders, and institutions affiliated with government, attending to relevant variations in understandings of aid, charity, volunteerism and help. This project compares the way that institutional aid (such as that provided by FEMA, Red Cross, the City of New York) and grassroots responses (Occupy Sandy, unnamed community responses) organized space and time, and how those divisions lead to very different kinds of aid and definitions of crisis. Because different ways of thinking about the spatial and temporal dimensions of the storm result in different aid, differing spaces and times of disaster are issues of justice. Large-scale disasters do not respect inherited jurisdictional boundaries or state structures, but can they change them? This project investigates the impact of Hurricane Sandy on the structures of governance in New York City and the wider region. How have the imperatives of cooperation been discursively and practically accommodated within a fragmented jurisdictional framework, and how have they challenged that framework? How did the disaster planning done prior to the storm stand up in the heat of the moment, and how is the storm changing how disaster planning gets done in the future? Even in areas where repairs and rebuilding have taken place following Hurricane Sandy, housing-related problems persist. They include less visible forms of physical and emotional damage, from mold and foreclosure to PTSD, as well as issues of long-term recovery and planning. SRL currently has two ongoing projects related to issues of housing and Sandy. Alexis Merdjanoff is examining the mental and physical health consequences of tri-state area residents who were displaced from their homes following Hurricane Sandy. This project follows previous work on Hurricane Katrina that established a link between different levels of home damage, housing tenure, and emotional distress. Liz Koslov is researching the proposed government buyouts on Staten Island, where many residents want to move rather than rebuild their homes. This is part of ongoing work on housing policy, the visual culture of urban redevelopment, and the politics of “retreat” after disasters. We use the case of Hurricane Sandy in New York City to make two arguments about how data mediates extreme weather. First, the techniques used to collect and organize data within databases have inherently rhetorical dimensions in addition to logics of relation and connection. This rhetorical power is political because of how it frames weather and disaster. Secondly, some groups, such as Occupy Sandy, acknowledge these politics and use disaster data and databases as forms of critical public engagement. That is, data both makes a worldview through how it frames and represents events, and it can be used intentionally to reframe the world for positive change. While most projects on data and change focus on how data is used after it is collected, we look at how collecting and storing data–or data creation–is also political and potentially activist in nature. Hurricane Sandy reinvigorated conversation about New York City’s plan for dealing with climate change and future extreme weather. Public officials, policy experts, and community groups compete to set the terms of this debate. To what extent does the storm mark a break with the preceding era of city climate politics, represented by the City’s PlaNYC strategic plan of 2007? Do actors emphasize the language and politics of adaptation or mitigation and how does these discursive positions map onto social locations? This study uses comparative content analysis across two points in time, several actor groups, and media forms to assess the changing landscape of climate politics discourse in New York City.